People seem to really like Michael Moore or loathe him with fiery, passionate intensity. Therefore, if you hate Michael Moore and you don’t agree with his politics, Capitalism: A Love Story is not going to be the movie for you. Quoth Cher Horowitz, “Duh”. Moore examines the financial bailout of Wall Street and the ensuing consequences for everyday Americans while decrying the evil natures of capitalism. Capitalism: A Love Story begins with an old educational reel about the fall of the Roman Empire. From there, Moore launches into an attack on Ronald Reagan, vilifying Reagan’s moves to help destabilize the unions and take care of his corporate buddies. The overall theme here is the exploitation and suffering of the working classes at the hands of the uber-rich. Moore makes an appeal for change, but I’m afraid that the message will only go unheeded. Moore also posits that capitalism is an evil system that can never stop growing, eating, and consuming at the expense of the everyday folks that help the capitalist machine run. He has a pretty solid argument. The problem is that rich folks abusing the lower classes and profiting off their suffering is nothing new. Perhaps we Americans thought it was impossible in the Land of the American Dream. It’s not a unique or new event in human history, and we humans do have an uncanny ability to fail to learn from our mistakes. Moore never clearly outlines an alternative to capitalism. The entire documentary is spent ruminating on how capitalism has ruined our society, but offering no sort of salient point on anything else. On one outing to Washington, DC, Moore stops by to see the Constitution to verify that there is no law declaring America to be a capitalist society. He’s correct; there’s not, but there’s no further ideas offered up. If Moore captures anything the best on film, it’s the pain and suffering of those steamrolled by the current economic crisis. A family losing their farm must suffer the indignity of cleaning out their own foreclosed house to receive a $1,000.00 check they desperately need. Another family lives in the back of a truck and others sob about life insurance policies taken out on deceased family members, because those workers were worth more to their employers dead than alive. Catholic priests are interviewed who slam capitalism as “evil” and Moore discusses the concept and prevailing idea that capitalism and Christianity can go hand-in-hand. Most of the free-market propaganda Moore finds he attempts to dissect and for the most part, it’s a well-reasoned critique. 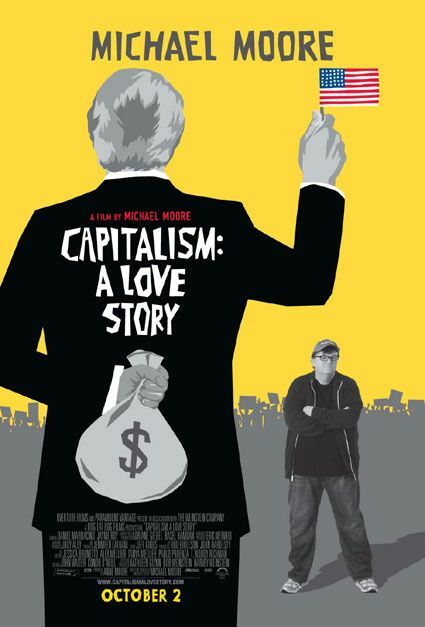 Capitalism: A Love Story is not a bad documentary at all. Moore points out some very genuine flaws in our political and economic system. The film is a warning and a sign post to change, and in typical fashion, experts are interviewed espousing this particular mindset. It is a deeply saddening film, one that I think really is important to watch, given the current economic climate and important in the sense that it has given a voice to some people who had none before. But long after the DVD was over, after I had watched this twice, and after I had time to really think about it, it does seem strange that someone so reticent to find capitalism anything but morally reprehensible would essentially use the capitalist system to make a profit off this particular movie.